Recently, I’ve been revisiting the art of the still-life, and that pursuit quickly led me the work Henri Fantin-Latour (1836-1904). Fantin-Latour is a bit of an enigma—he produced work in three contradictory styles for his entire artistic career. He was an expert and innovative lithographer, a painter of portraits, self-portraits, flowers and still-lifes, but his least-known and appreciated works are what he called his imaginative compositions. These paintings and lithographs, largely inspired by the music of Wagner, Schumann and Berlioz, were considered by Fantin-Latour to be his most important work. Ignace-Henri-Jean-Théodore Fantin-Latour was born in Grenoble in 1836—his father, a painter, moved the family to Paris in 1841. 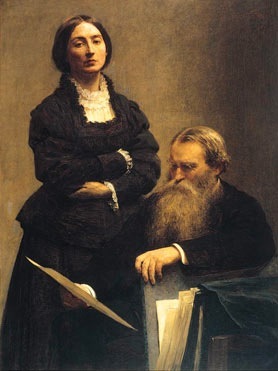 Fantin-Latour lived in Paris most of his life, and the Louvre became the center of his artistic universe. He often said: “Le Louvre, il n’y a que le Louvre.” (The Louvre, there is only the Louvre.) Beginning when he was fourteen, Fantin-Latour entered a professional drawing school, where he studied under Horace Lecoq-de-Boisbaudran, who believed that memory was a spur to the imagination. 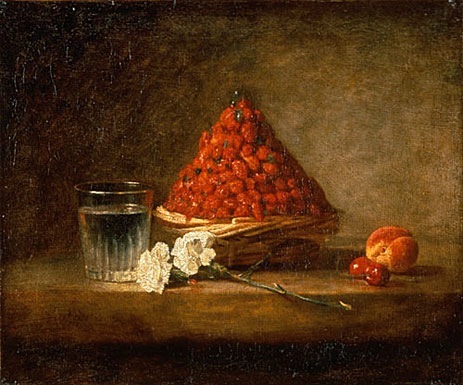 He would set up a complicated still-life and discuss it with his pupils in elaborate detail. Then he would dismantle the still-life—and the students would begin to paint it from memory. This discipline informed Fantin-Latour’s work for his entire career. 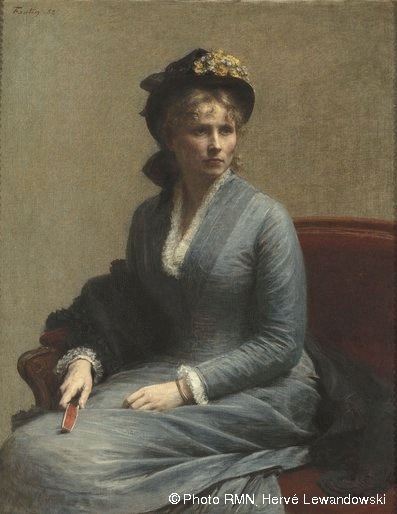 In 1854, Fantin-Latour attended the École des Beaux Arts on probation for three months, but was not awarded a permanent place. 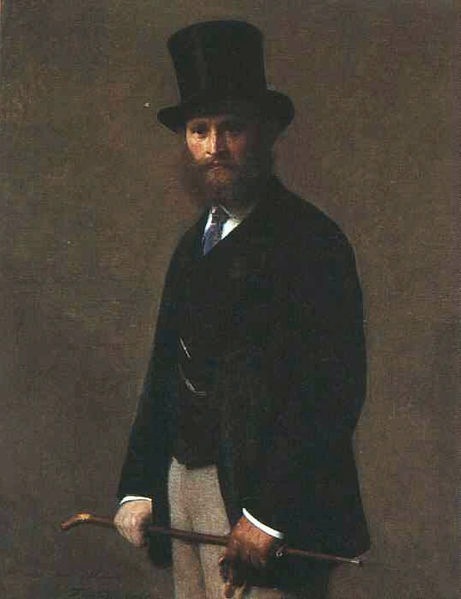 As a result, when he was 17, Fantin-Latour began to spend his days at the Louvre, copying the work of the masters, a practice he continued for many years. This deep study of Delacroix, Boucher, Fragonard, Rembrandt, Watteau, Giorgione, Rubens, Chardin, Hals, Titian and others shows itself throughout all aspects of his work. 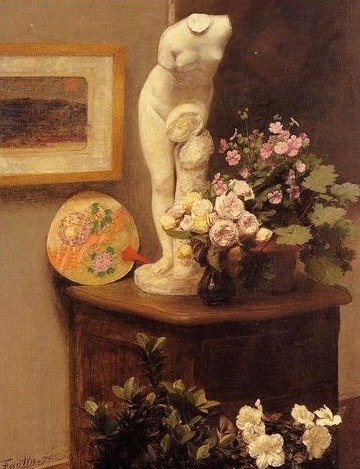 The Louvre was Fantin-Latour’s refuge, and in many ways his painting feeds more on other paintings than life or nature. 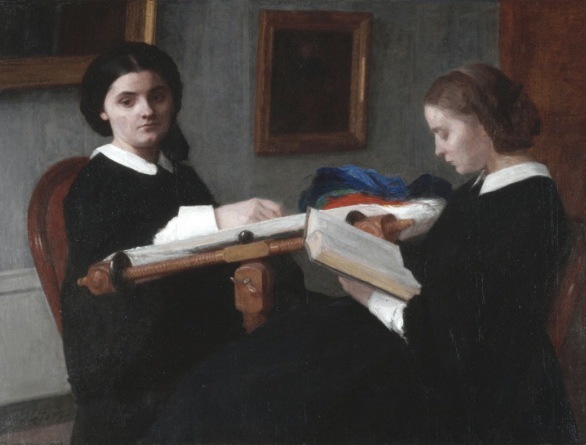 It was at the Louvre that Fantin-Latour first met Édouard Manet, James McNeill Whistler, Berthe Morisot—and his future wife, artist Victoria Dubourg. 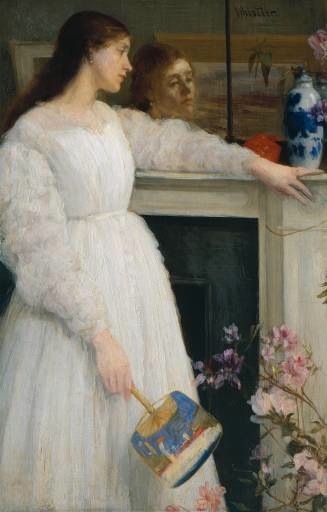 In 1859, Whistler invited Fantin-Latour to London, where he introduced him to John Everett Millais and other Pre-Raphaelite painters, as well as to Mr. and Mrs. Edwin Edwards. 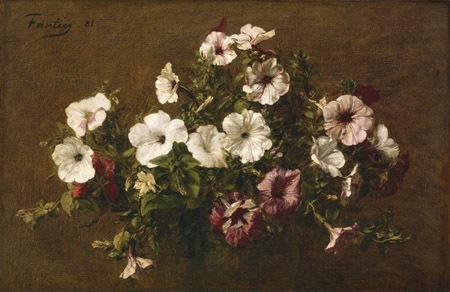 The Edwards bought many of Fantin-Latour’s flower paintings, and found other buyers among their circle, securing him a regular and steady income. Between 1864 and 1896 Fantin-Latour painted over 800 floral portraits, and almost all were purchased in England. 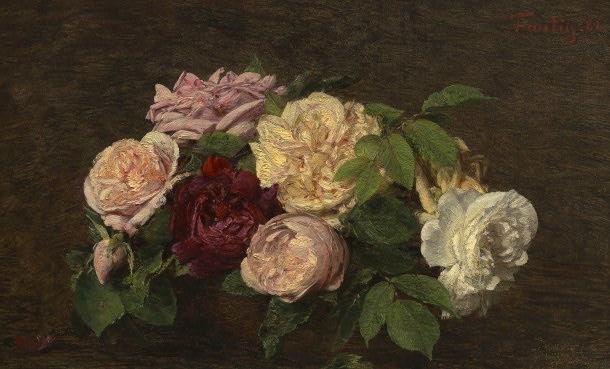 Fantin-Latour painted roses more than any other flower, but he also painted an enormous variety of old-fashioned cottage garden flowers, such as petunias, hollyhocks, tulips, dahlias, larkspur, forget-me-nots, peonies, sweet peas, hyacinths and cherry blossoms. He favored whites, yellows and pinks because he loved the luminosity of the pastel flowers. He had a deft hand with arranging flowers in a balanced yet naturalistic way, and the paintings, with the flowers silhouetted against a subdued background, have an enveloping atmosphere. They have a musical quality—a harmony of value, color and tone—that creates contrast and depth. Fantin-Latour also beautifully captures the contrasting surfaces of the vases, whether Chinese porcelain, enamel or clear glass. Imagination in art consists in knowing how to find the most complete expression of an existing thing, but never in inventing or creating the thing itself. Fantin-Latour’s paintings were an eclectic mix—Realism tempered with Naturalism and a deep Romanticism—and a small dose of Impressionism. He also took some ideas from Japanese art and photography, both of which were so influential at that time. From the work of his friend Whistler, he learned about cool harmonies, the use of gray backgrounds, and to occasionally incorporate some Japanese elements. He is a model who is always ready, who offers all the advantages, he is punctual, co-operative and one knows him before beginning to paint. 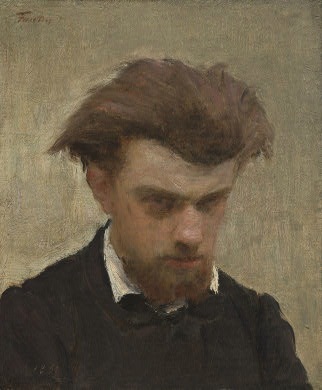 Fantin-Latour was a bit of a loner—in fact, after his marriage he was content to stay in his family circle, joined only by a few close friends. He no longer frequented the artist cafés on the Boulevard St. Germain where he had spent so much time previously. His aloofness often affected his subjects, in some of his portraits you sense a cool distance. However, the portraits of his friends and those within his family circle are especially lovely, particularly his early portraits of his mother or sisters Natalie and Marie, and later his wife’s family. These familial works are dignified, serene and beautifully evocative. Fantin-Latour painted five large group portraits, four of which still exist. The painting below, Homage to Delacroix, was painted a year after the great Romantic painter’s death. Like all of Fantin-Latour’s group portraits, its composition and color palette is a nod to the great 17th century Dutch portraitists, particularly Franz Hals. 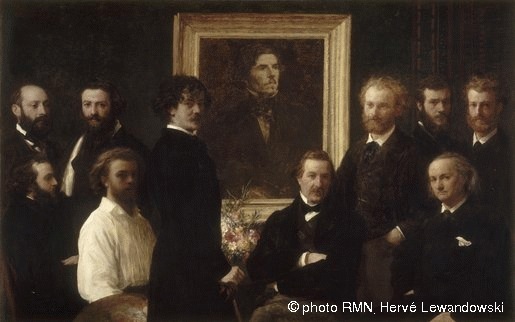 Among those grouped around a painted portrait of Delacroix (done from a photograph taken ten years before his death) we see Fantin-Latour, in white, and his friends, the poet Charles Baudelaire—who called Delacroix “the most suggestive painter of all”—James Whistler and Édouard Manet. 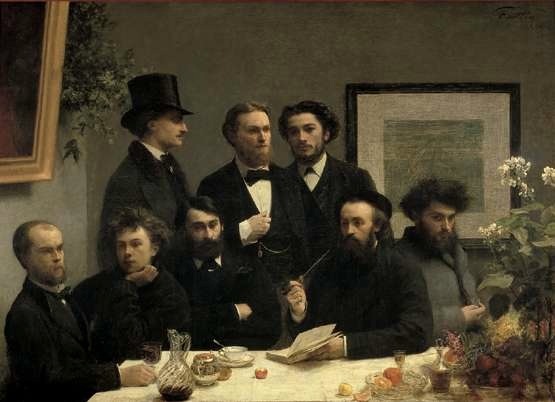 The group portrait below includes many of the important poets and writers of the later 19th century, many from the Parnassus poetry group, including (seated, left) Paul Verlaine and Arthur Rimbaud. 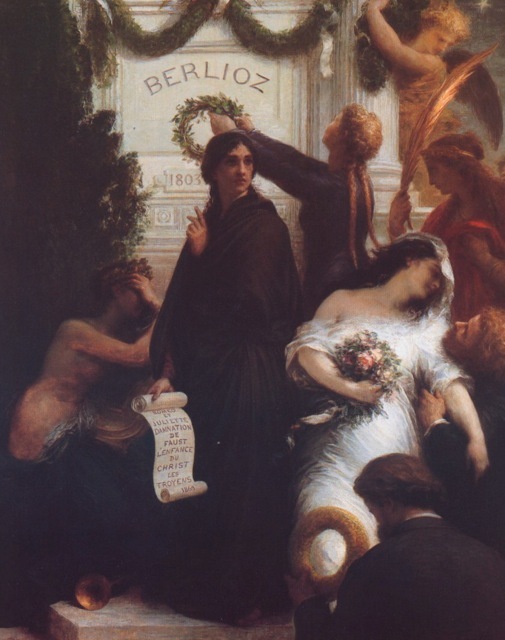 Missing is Charles Baudelaire, who died in 1867, and Albert Mérat, who, the story goes, refused to be depicted with the transgressive Rimbaud and Verlaine, and was replaced by a large bouquet of flowers. Around the painter so disparaged by the public has grown up a common front of painters and writers who claim him as a master. 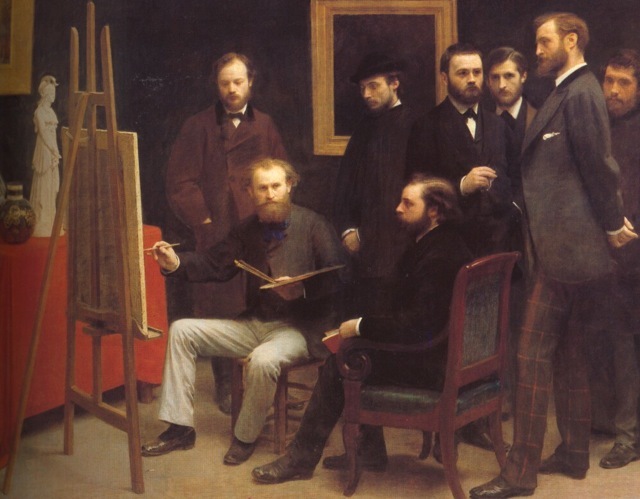 Although Fantin-Latour had not joined Manet and the others in their move towards Impressionism, by painting his Portrait of Manet and this group portrait, which showed these radical young artists to be sincere and respectable, Fantin-Latour was making a strong statement of support. 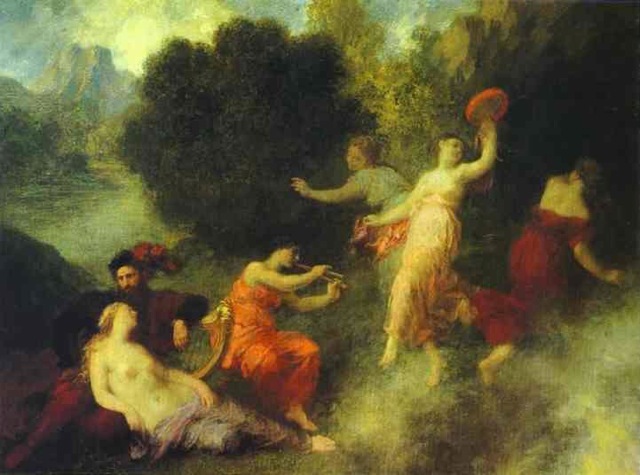 Fantin-Latour’s intense interest in music began when he first heard Richard Wagner‘s Tännhauser, and it inspired his first image of a musical scene, the first of many done on Wagnerian themes. 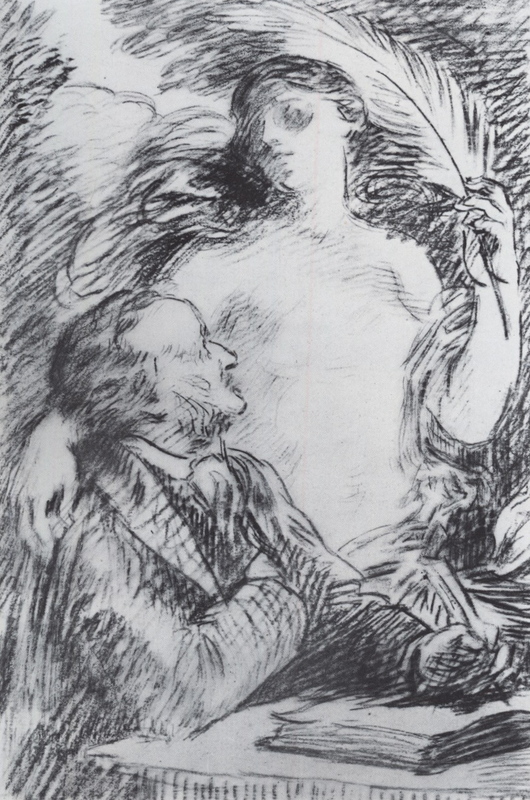 In 1864 Fantin-Latour said “Schumann is, with Wagner, the music of the future.” When Fantin-Latour traveled to Bayreuth in 1876 to hear one of the first performances of Wagner’s Der Ring des Nibelungen, he considered it one of the most important events of his life. On the subject of the musical works, I cannot be objective—the first time I saw Tannhäuser, as a young girl, was for me, as for Fantin-Latour, a life-changing event. As an ardent Wagnerian, I find the images deeply evocative and full of meaning—I can hear the music when I look at them. Critics complained that the allegorical and mythological works were re-workings of compositions by the old masters and added nothing new. There is no doubt that Fantin-Latour drew on his visual memory from those years spent in close observation at the Louvre when creating these works. I do agree that the accomplished, innovative techniques of the lithographs make them somewhat more interesting than the paintings done in this style. 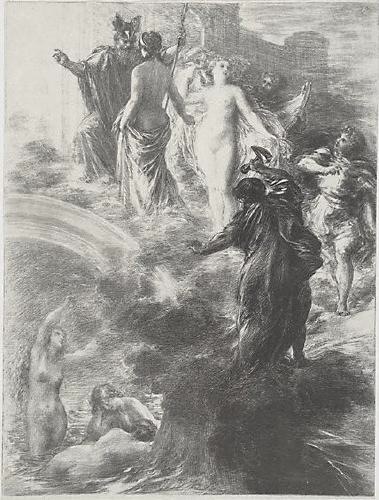 However, it is ironic that while Fantin-Latour’s oeuvre is often criticized for being too much of his time, for not breaking any new ground, these neglected musical and allegorical works were in a sense a pre-cursor of the French Symbolist school of the late 19th century. I hope that even those immune to the charms of these pieces will acknowledge that they are beautifully and skillfully rendered. 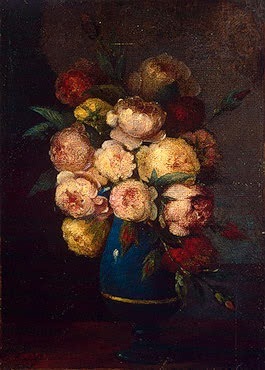 A ravishing still-life by Fantin-Latour; a pitcher of blue glass and fresh-cut flowers; each painting bears a hushed silence that bids us still the inner voice. This entry was posted on February 24, 2010 at 2:19 pm and is filed under Christine Cariati, Fine & Decorative Arts, Painting, Printmaking with tags Arthur Rimbaud, Berthe Morisot, Charles Baudelaire, Claude Monet, Edgar Degas, Edouard Manet, Emile Zola, Eugene Delacroix, Francois Boucher, Franz Hals, Giorgione, Gustave Courbet, Hector Berlioz, Henri Fantin-Latour, Horace Lecoq-de-Boisbaudran, James McNeill Whistler, Jean Antoine Watteau, Jean-Baptiste-Simeon Chardin, Jean-Honore Fragonard, John Everett Millais, Joris-Karl Huysmans, Louise Moillon, Marcel Proust, Paul Claudel, Paul Verlaine, Peter Paul Rubens, Pierre-Auguste Renoir, Rembrandt, Richard Wagner, Robert Schumann, Titian. You can follow any responses to this entry through the RSS 2.0 feed. You can leave a response, or trackback from your own site. Thorough as usual! I’ve loved Fontin-Latour’s floral portraits for years because of his individual treatment of each flower, interesting colour schemes and seemingly effortless technique. Somehow he manages to make the whole painting look like a close up view of petals. I can only describe the total appearance as “velvety”. Seeing several in the flesh so to speak enhanced this impression. I am most attracted to his “uncluttered” compositions. Thanks for putting his work in a broader context. I’m always amazed by the depth of research put into the posts on Venetian Red. My art knowledge is growing in leaps and bounds. I look forward to these essays. They add so much to my appreciation of artists I thought I knew well. Indeed, M. Alsina is correct. 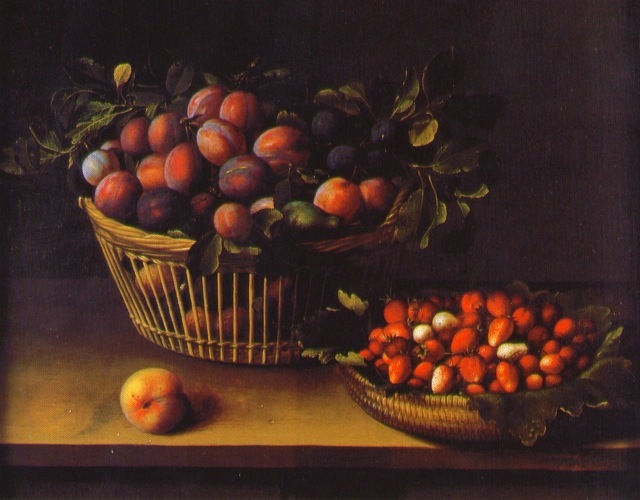 Further research yielded Basket of Strawberries and Basket of Plums to be oil on wood panel in Toulouse not in Portland as we originally indicated. Thank you to M. Alsina for pointing this out. Checking in with Venetian Red is a glorious immersion into an art history class already in session but in my own home. Brava, as usual, on the depth of your research and reporting. Re the Fantin-Latour report. I haven’t seen his work in awhile and I was familiar with only his florals which are the luminescent essence of flowers. Besides the florals, I so enjoyed learning about his other work. Like his florals, his portraits and especially his self-portraits cut to the chase and speak of his impressions of himself. And any student of art history loves seeing portraits of their favorite painters, to catch a glimpse of the creators behind beloved works (Manet, et al). Now I need to catch up on recent articles — I’ve missed a few and chastise myself for doing so. thanks very much for this informative piece. The quotes by Claudel and Courbet are wonderful. 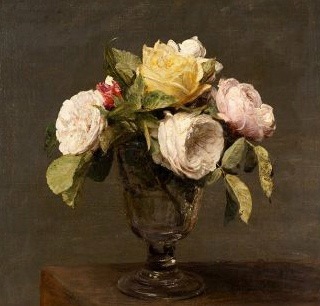 As a painter of flowers I have been influenced (astounded, delighted) by Fantin Latour for many years. There’s a painting of chrysanthemums in the Glasgow City Art Gallery which defies any understanding of his technique…tiny liquid marks in many colours and tones seem to weave the picture into being. They are very gentle pictures, aren’t they? Enjoyed reading your article on Fantin Latour.I think that two of his best portraits are the ones he did of Marie Yolande de Fitz-James and her sister in 1867.He also painted their grandmother the dowager Duchess of Fitz-James in the same year. ( She is always incorrectly referred to as their mother ).Fantin Latour was going to do a group portrait of the family of the Duke of Fitz-James ,but for some reason the project was abandoned.I don’t suppose you would know why? Fantin Latour did a preparatory sketch.Perhaps the Duke ( a direct descendent of the exiled James II ) did not like the artist’s portrait of his son ( Marie Yolande’s brother ), which is not one of Fantin Latour’s best works.I wish I knew more about his relationship with the Fitz James family. Thank you for your article. 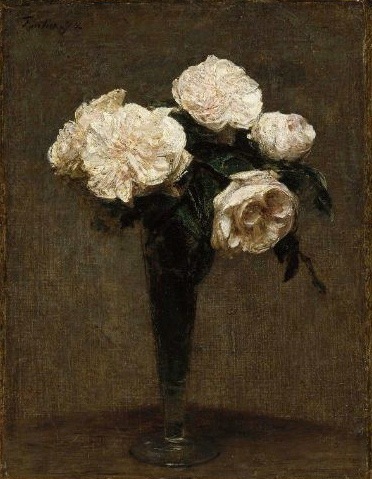 You encapsulate my admiration for Fantin-Latour. I saw an exhaustive exhibition of his work in Paris in the early 80s and it was a defining event for me. Recent travel experiences have reinforced that initial regard. I am a musician and was amazed to read the comments you quoted about how colour and music resonated for him. I have always felt that musicality in his paintings. Lke you I find Fantin-Latour’s three distinct avenues of expression fascinating. He was dedicated to his craft and remained faithful to sincere artistic goals. He may not have been a trail-blazer but for me he deserves a place among the greats. Great post! I’ve walked past this artist’s work countless times but found yesterday myself transfixed by his restrained, melancholy portrait of his sisters. Your essay is an illuminating introduction to an artist often overlooked. Your article is wonderfully expansive. I am in Lyon at present looking for the second time at The Reading owned by the Musée de Beaux-arts. Your anecdote on the early schooling, still life from memory, as well as the Courbet quote reinforce my perceptions of this painting. It is the most temporal work I know, and the one I most consider to encapsulate the notion of the tableau in all its mystery as an entity , stand-offish, independent, looking back at the viewer There is something that has been discovered here, in the scene and in thep field of energy between sitters and between sitters and artist. Thank you for your comment and for bringing that lovely painting to my attention. Fantin-Latour’s Woman Reading, at the d’Orsay, is another truly beautiful painting, love the way she is enveloped in that chair, her stillness. Thanks, I saw those. I will keep checking in with your blog. The square in Lyon looks wonderful. Will try to get to Lyon on my next trip to France. Isn’t there a famous textile museum there? The musée des tissues is a very good one for a history of fabric produced in Lyon, as well as other cultural textiles that have influenced this production, some beautiful old Middle Eastern examples. It’s said that the museum doesn’t show a lot of it’s collection for copyright reasons, I don’t know. We visited the St-Etienne Museum of Art and Industry recently, they have a very good exhibit of decorative ribbons produced since the 18th century, it’s 40 minutes on the train from Lyon. For all those who are interested in the works of Fantin Latour; come to Holland! From october 2013 to april 2014 there will be a solo-exposition of (a selection) of his works in Gouda (the cheese town). See: http://www.museumgouda.nl for more information. With kind regards.